Paleontologists from the University of Southern California studied the tooth of an extinct shark, which was stuck in the cervical vertebra of a large flying reptile 80 million years ago. The data obtained allowed us to learn more about the interaction of two ancient creatures. In the Late Cretaceous, North America was divided by a giant reservoir known as the Western Inland Sea, which stretched from the Gulf of Mexico to Canada. Here, experts find the most curious fossils of the time: the Smoky Hill area in Kansas is particularly famous, where the recently described remains were discovered. Samples were found in the 1960s and until recently kept in the Los Angeles County Museum of Natural History, after which a group of scientists led by Dr. Michael Habib from the University of Southern California extracted it from the exposition for further study. Scientists have been intrigued by this shark tooth, since more than out of 1,100 samples of pteranodon, only seven (less than a percent) indicate a predator-prey interaction. While dinosaurs walked the Earth, pteranodons were masters of the heavens and dominated flying species. They had a massive crested skull, a wingspan of five and a half meters, and their weight was almost 45 kilograms. These creatures could travel long distances, land on the water and take off from it, hunting for sea creatures. Apparently, here the danger awaited them: large predatory reptiles and sharks hid under the smooth water. Scientists tried to find out what kind of monster could kill pteranodona and how it happened. As a result of the study, which was published in the journal PeerJ, experts managed to come to some conclusions. 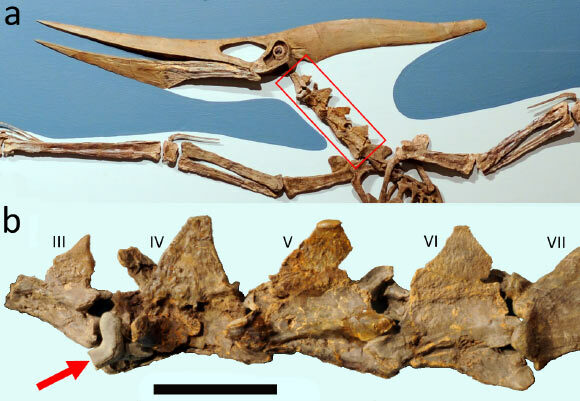 First, paleontologists had to exclude that a shark’s tooth about 2.5 centimeters long attached to the vertebra of pteranodon by accident: experts found that the tooth was stuck between the ribs in the cervical vertebrae, which was clear evidence of a bite. The tooth belonged to a large cretoxirin (Cretoxyrhina mantelli) – this ancient extinct shark predator was large, fast and powerful, its size was about 2.4 meters in length, and the beast was approximately comparable in appearance and behavior to the modern white shark. Secondly, the team wondered why the evidence of the collision was generally preserved. As a rule, a heavy shark bites the shattered bones of the pterosaur, leaving few traces. In this case, the tooth is accidentally stuck in the bony part of the neck. According to scientists, this case is so rare that it can be considered the first recorded interaction of this type of shark with a pterosaur. 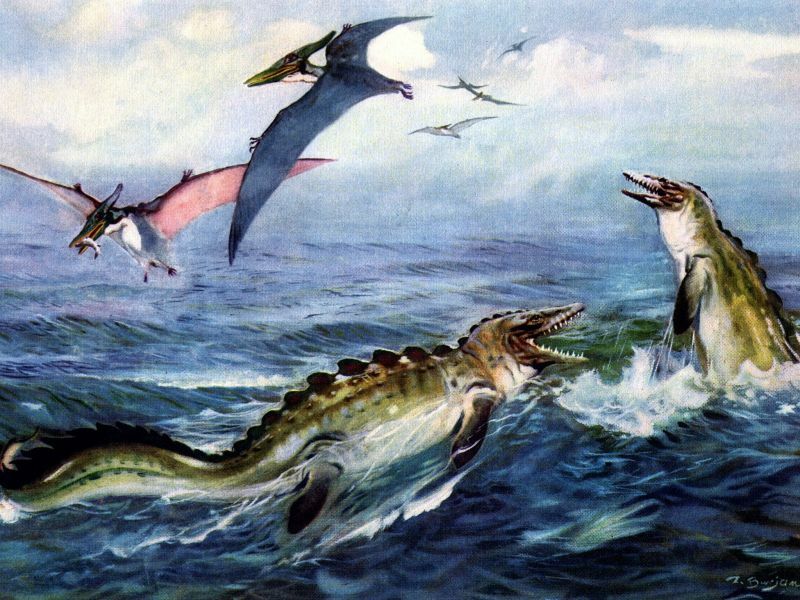 Third, although the researchers will never be able to find out the truth for sure, they assume that the attack occurred when the pteranodon was the most vulnerable, stretching above the water, as they spent a lot of time landing or taking off. “Studying the behavior of these animals is important for understanding life on Earth for a long time: for example, we now know that sharks have hunted flying animals for another 80 million years,” the scientist sums up.